PM Consulting Solutions - William George Associates Ltd.
Our recommended first step in helping clients is to perform an assessment of current Project Management Capability. This consists of 2-3 days of interviewing and analysis that renders a baseline score for each of the three elements that comprise PM capability: People, Process, and Software tools. The client is presented with the Project Management Capability score and then establishes a desired level of Project Management Capability for the organization. 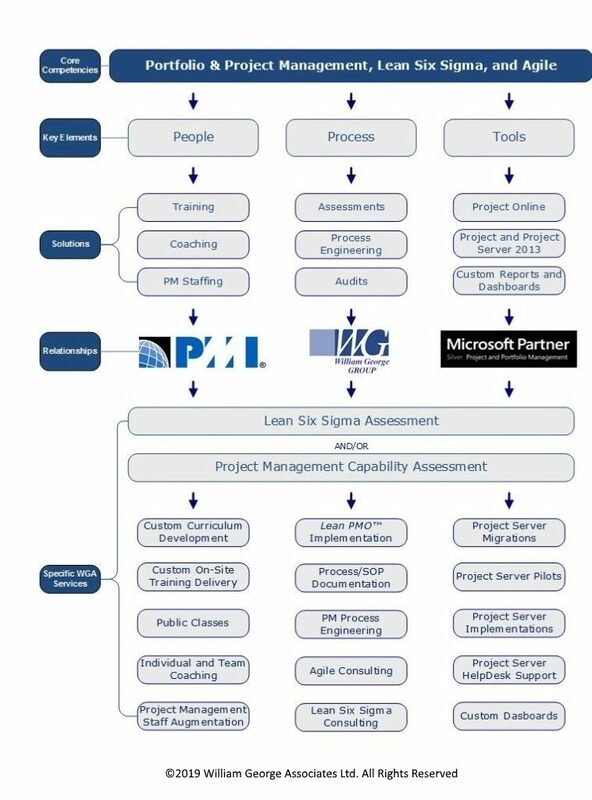 The comparison of the current to the desired Project Management Capability scores establishes the Gaps to which WGA training and consulting solutions are applied. The Solution Design process includes detailed planning with the client to identify the WGA services and work required to close the gaps. This exercise is important because it provides the client insight into PM Best Practices for Work Breakdown Structure (WBS) and schedule development, budgeting and risk management, as well as communication of performance to plan. This is the execution of the plan created during Solutions Design and includes weekly communication between WGA consultants and the client to assess performance to plan and verify client satisfaction. This approach takes the surprise out of project performance and we believe this is another way we role model PM Best Practices for our clients. Adjustments are made to the plan only with input from the client. As new knowledge, skills, and software tools are deployed, WGA provides ongoing support to enhance the full integration of PM Best Practices into the standard operating behavior of the organization.